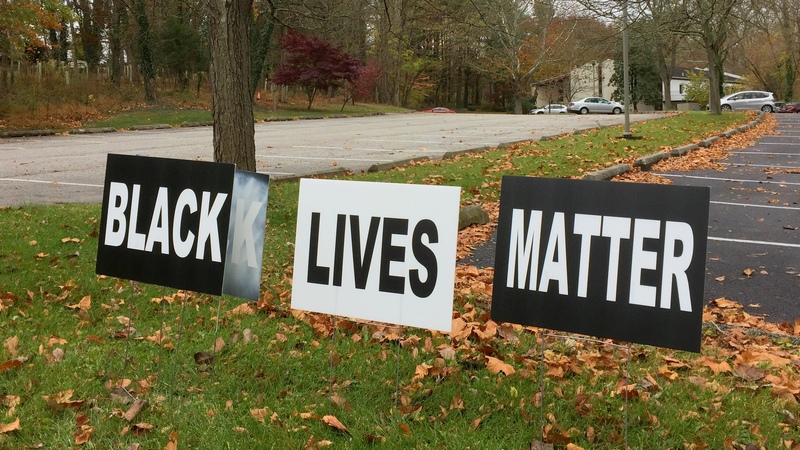 On the afternoon of Friday October 14, I gather that you were overcome with anger at the newly installed “Black Lives Matter” banner on Dulaney Valley Road in front of the Towson Unitarian Universalist Church. You tore it down just days after we erected it. 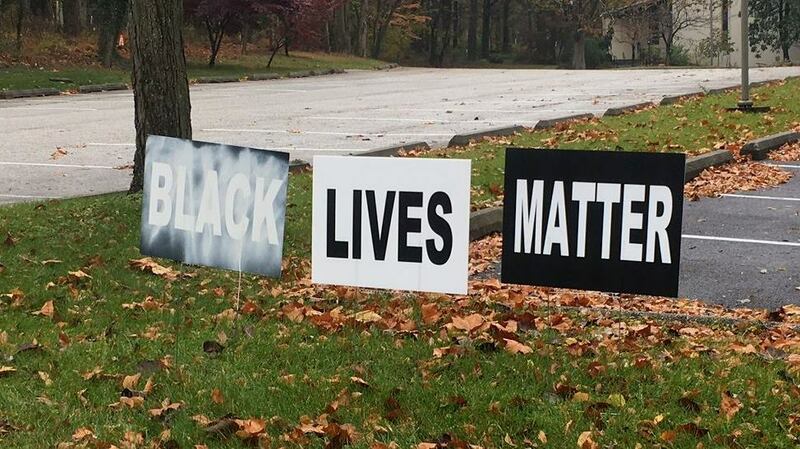 We put up some smaller new Black Lives Matter signs a few weeks later . . . and maybe you’re also the person who stole them. 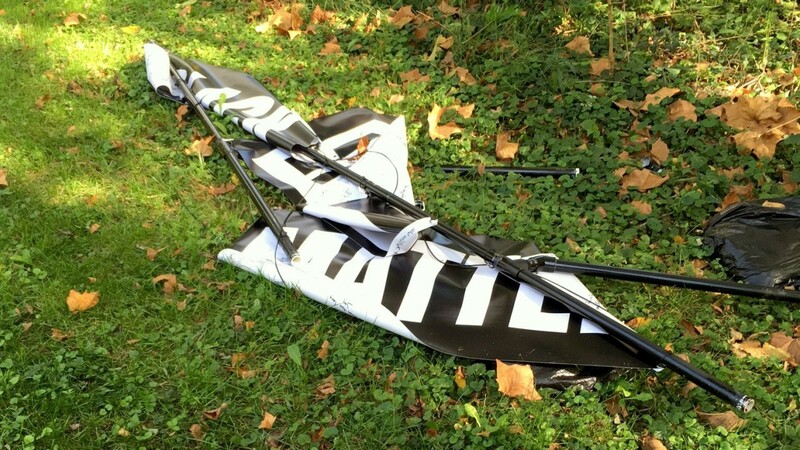 Then on Election Day, in the evening while we were inside the church, someone defaced another one of those signs we put up, spraying white paint over the word “Black.” Was this also you? Since Donald Trump is now our president-elect, I think it is even more important than ever that we find a way to communicate respectfully with each other. Racist vandalism like this has surged across the country and things are changing ever so fast. Whatever your underlying reasons, I understand that you must have taken offense at this decision by our small church. 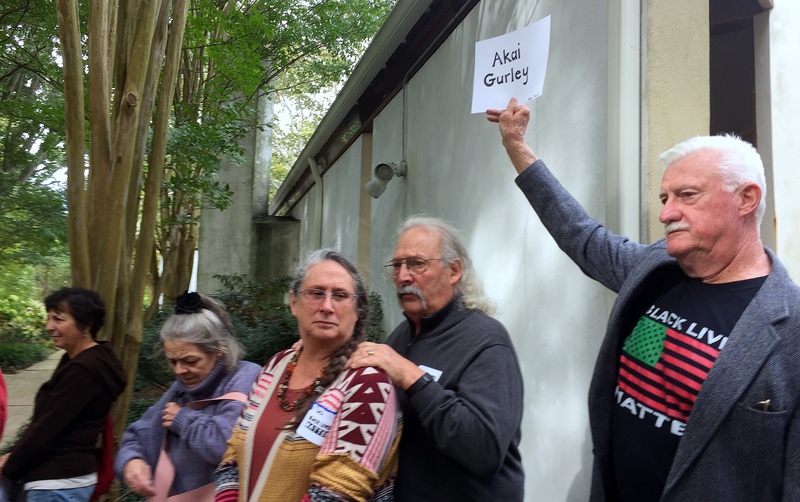 Like many in our predominantly white congregation (myself among them, not so long ago) you may have said to yourself: Of course black lives matter, but they do not deserve any more consideration than anyone else. In other words, all lives matter! I agree. All lives do matter and none should be held in higher esteem than any other. However, before you decide what you think of our signs, you might want to consider our congregation’s rather complicated path to putting them up. Our decision to erect the banner was not one that we came to in a single moment of passion. However, after a lot of debate and more than a few pretty animated discussions, something shifted in our minds. A few months ago, our congregation put the question to a formal vote. We agreed, almost unanimously, to install the banner. As for myself, I must go back to my own childhood, beginning at age three-and-a-half. My family lived in a small town in western North Carolina not far from the South Carolina border. One day I asked my mother why Doris, who cleaned our house, lived on the other side of the tracks. As a young child, I was thinking literally. I did not yet know what that phrase meant to adults. But my mother’s reaction back in the 1950s remains a powerful memory because those with darker skin, whose ancestors were brought to this land forcibly by my ancestors, are now, 60 years later, still viewed and treated differently than me and my white neighbors. A few in our congregation said, OK, but we should also include another group on our banner: Blue Lives Matter! For me this had a strong resonance, for I had another vivid memory from my teenage years in the 1960s. I lived in Maine then, and being somewhat rebellious at that time, I went to Portland to a protest march against the war in Vietnam. I saw a police officer and the words just flew out of my mouth: I called him a pig. That moment stands even more vividly frozen in my mind. We stood there, taking each other in for a period of time. Neither of us spoke another word. I don’t know whether it showed on my face, but in that instant, I was changed forever: All lives do matter, and all people deserve respect. There is no denying it. The seeds for my own transformed opinion were planted about 10 years ago. I had just moved to Maryland, having ended a decades-long career in marketing and advertising. I began volunteering at a group home by helping one of its graduates get his driver’s license. He was a powerfully built African American man in his early twenties, and I was most impressed with his brilliance and his kind and humble demeanor. We spent a great deal of time, the two of us in my car, as he put in his road hours. Some time after, in order to thank me, he invited me to visit him. He wanted to cook a meal for me, so I drove to his place in East Baltimore and as we sat in my van afterward in the abandoned Old Town Mall parking lot, it must have looked to passing police like a drug deal was taking place. A squad car pulled up, and an officer asked to see my driver’s license and registration. The officer returned my credentials and, in fairly short order, three more police cars pulled up and surrounded the van. The officer moved to the passenger side and asked for the ID from my host. My young friend, I noticed, had visibly stiffened. He looked straight ahead and, with mechanical politeness, answered the increasingly aggressive interrogatories. When I began to come to his defense, my young friend turned to me slowly, looked me straight in the eyes and with exaggerated calm, raised his hand to silence me. After about three quarters of an hour, with an officer standing in front of the passenger window at all times, they finally (and politely) turned to me, suggested that this was not a “safe neighborhood” and recommended that I move on. I have been processing that incident in my own slow way over the intervening decade. My answer today: It is time to change what it is. 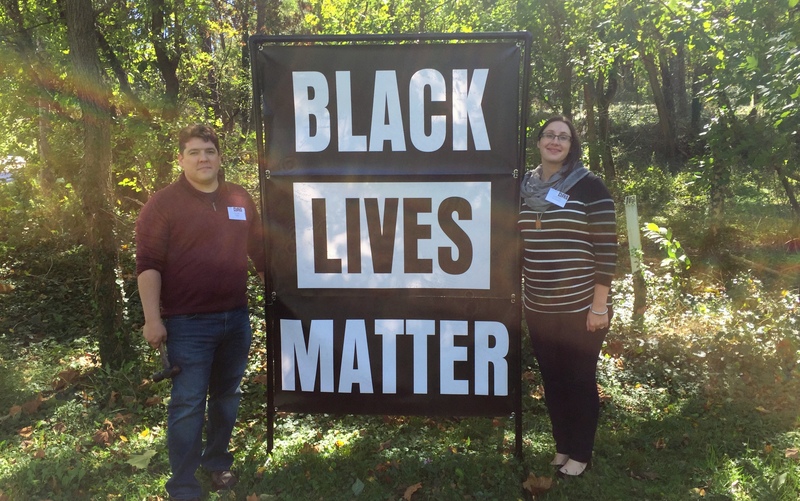 Our sister congregation in Baltimore had warned us about their experience with Black Lives Matter signs, so we were braced. But that didn’t make it hurt any less. 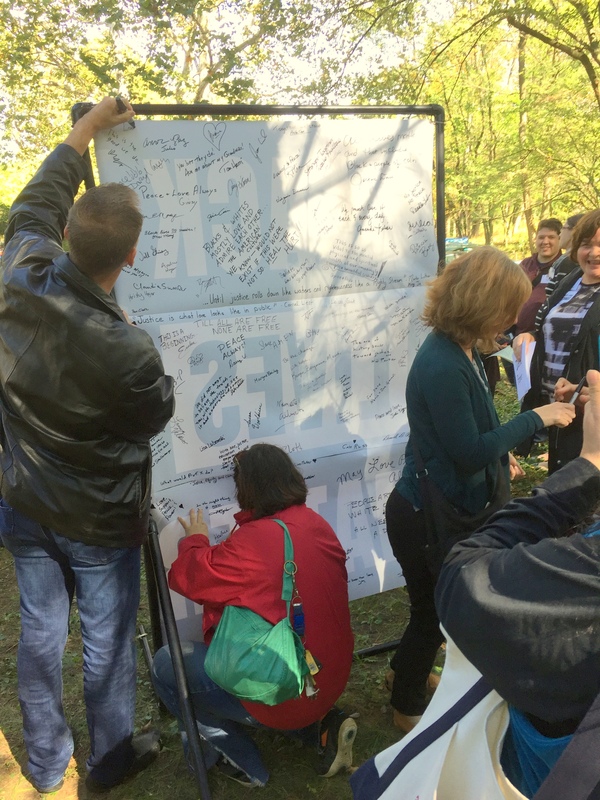 We had all signed the back of the banner at a ceremony where people carried placards with the names of African-American people who have died in some of these police encounters. Some might chuckle or roll their eyes at a bunch of white people holding up signs and chanting “Stay woke!” but for me, that’s what made it kind of magical. We have reported all the vandalism incidents to the police. We have ordered a backup banner and are now discussing where to place it. We have talked about what else we should do. Prosecute? My preference is not a war but a dialogue. I know that I need to understand what you were thinking when you did this. And I wish to let you know what motivated us. It’s a conversation we’re prepared to have for a long time. We have a lot of signs. 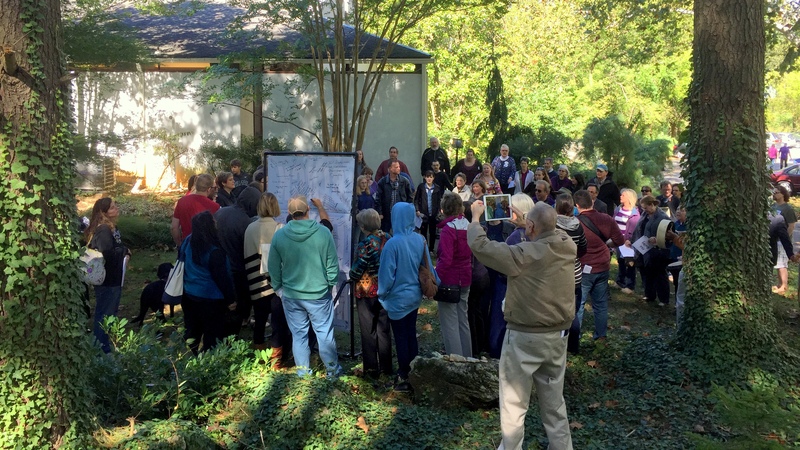 Stephen F. Brown-Pearn is the Social Action Committee Chair at the Towson Unitarian Universalist Church at 1710 Dulaney Valley Road, in Towson, Maryland.